Passing on The Gift© is far more than a handy catch phrase for Heifer International. It represents success of a family moving from recipient to donor, hope for a family to gain a sustainable livelihood, and continuation of the circle of lifting families up from hunger and poverty. Heifer Sacramento had the opportunity to pass on a gift to acknowledge seven dedicated congregations in the Sacramento region that have provided exemplary support to Heifer International year-after-year. 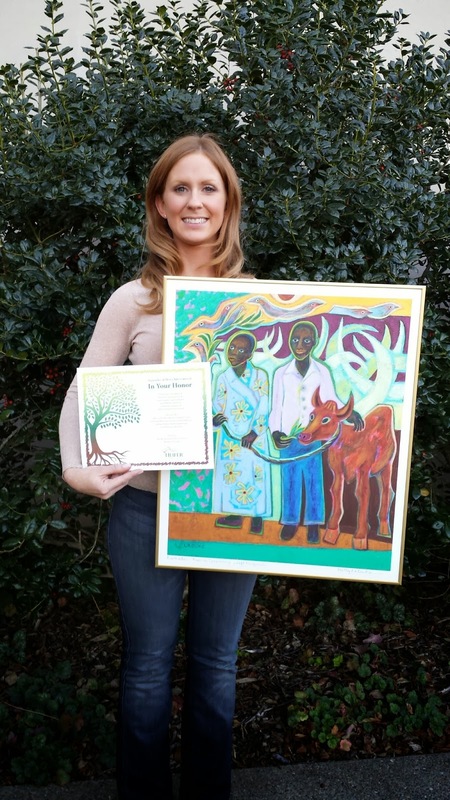 These seven congregations were chosen to receive Betty LaDuke artprints as gifts from Heifer International and Ms. LaDuke for their steadfast generosity and support of Heifer’s work. Presentations have been made to Carmichael Presbyterian Church, Fremont Presbyterian Church, and St. John’s Lutheran Church. Ms. LaDuke is a world renowned artist based in Ashland, Oregon. In her many trips to Africa, Asia, Latin America, and Central and Eastern Europe with Heifer International, Ms. LaDuke has created body of work that embraces cultural understanding throughout the globe. Her work captures the hardships, beauty, and dignity of the people that Heifer International helps. Congratulations and Thank You to the dedicated congregations of Carmichael Presbyterian Church, Fremont Presbyterian Church, and St. John’s Lutheran Church for all you do to help lift lives around the world! 0 Response to "Passing on Gifts to Honor Generosity"